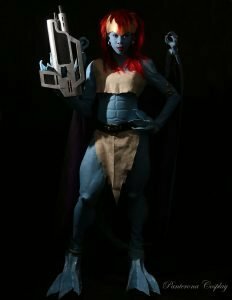 With our continuing coverage of Women’s History Month, BlackSci-Fi.com recently caught up with one of the most popular cosplayers around, Panterona of Panterona Cosplay. 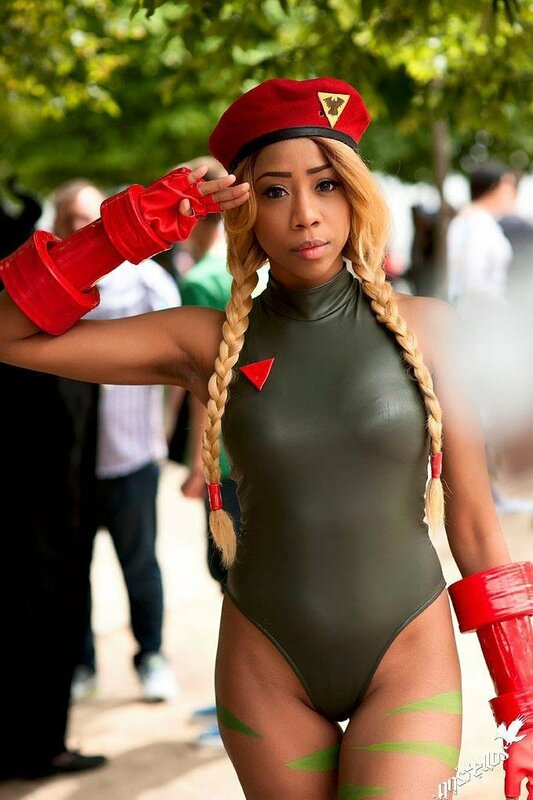 A Caribbean cosplayer from the island nation of Trinidad and Tobago, Panterona has made a huge name for herself within the world of cosplay, with a FB following of 9,210 fan likes and counting. 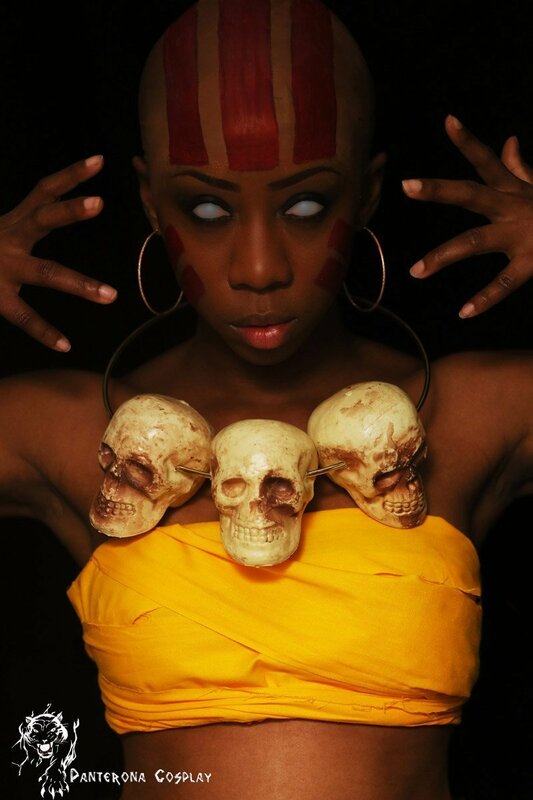 Her ever growing selection of costumes range from such pop culture icons as Cammy and Dhalsim of Street Fighter fame, to Aalliyah’s Akasha from Queen of the Damned. Panterona spoke at length about her career, what it takes to be a cosplayer, and the Carribean cosplay scene in a recent interview. BlackSci-Fi.com: What drew you to cosplaying? How long have you been doing this? Panterona Cosplay: So, I honestly thought cosplay was a bit extreme when I first saw it. I was a fan of anime/comics/cartoons etc. but felt that dressing up as a character was taking it a wee bit too far. That is until someone dressed up as my FAVORITE character of all time (Kenshin Himura) hahaha. I threw the gauntlet all the way down thinking I could do a better job at it so at the next anime convention I dressed up as his alter ego, Hitokiri Battousai. I entered and won the local cosplay competition in that costume and have been hooked ever since! I believe I have been cosplaying for about 11-12 years now. BSF: Can you give an idea of how long a normal process takes to put together a costume/ piece? What goes into the process in terms of cost, time spent producing the costume, creating an idea for a costume, etc. PC: Well this really depends on the costume. I have made entire cosplays in the space of 1 hr eg. Dhalsim, and have spent as long as 8 months making others eg. Demona. So it’s not really possible for me to generally state how long it takes me to create a cosplay. Depending on the complexity I may have to do up a list of all the costume parts, where I hope to source the materials and make sure my timelines for purchasing, shipping and delivery line up with my timelines for crafting and the scheduled completion of the individual pieces. Lists and schedules are my life! 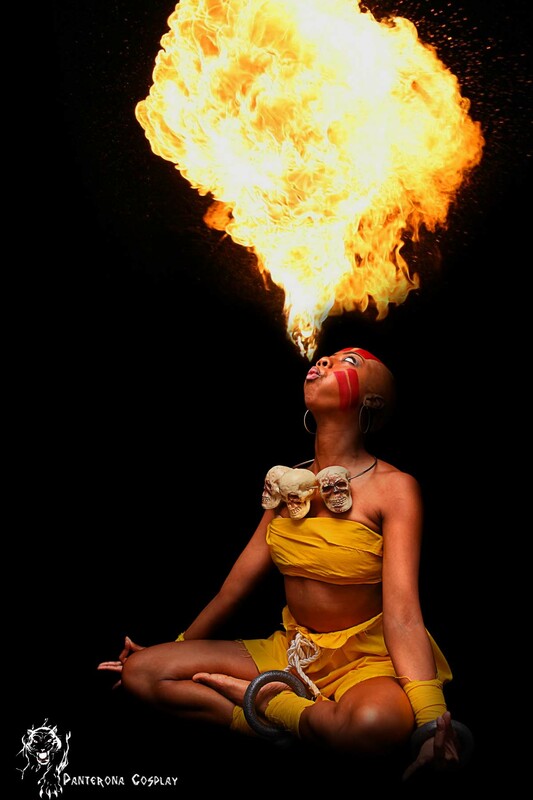 BSF: What is the cosplay scene like in Trinidad and Tobago? PC: Evolving! When I first started cosplaying, cosplay as a hobby or artform was only around for about 2 years. If you do the math, this means that cosplay has only existed in Trinidad and Tobago for roughly 13-14 years, which isn’t very long at all. However in that space of time it has evolved from really humble beginnings and we now have more people who produce high quality pieces. The internet has played a really big role in that respect, by making so many techniques and materials more easily accessible for us here in the Caribbean. Our community is pea sized in comparison to the bigger countries but would you believe that we have more than tripled in size since cosplay first started? Many of the older cosplayers who started the scene aren’t active anymore but we now have a new generation of cosplayers who are continually pushing the envelope. We have our share of drama as exists in any other scene but for the most part cosplaying in Trinidad is fun, carefree and very inclusive. BSF: Do you have a background in terms of any particular fandom? Comics, sci-fi, fantasy etc. How do you feel this fandom influences the costumes that you create? PC: I wouldn’t say I do actually. I dabbled in a little of everything growing up, coupled with my fickleness I don’t think I’m built for longevity in any fandom hahaha XD. BSF: What was your first experience like heading to a convention in costume? How was reception to your piece? PC: My friend, let me tell you a story…..one I barely remember in that much detail hahaha. Man, this seems like a lifetime ago. I remember running around and posing for pictures for most of the day. Back then there weren’t that many digital cameras so it was all about them polaroids; you had no idea how the photos would look until you went to develop the film. I do remember people being impressed with my cosplay since I did win the cosplay competition so I was feeling myself that day hahaha. Oh! and there was one guy who was hitting on me all day but since I was in crossplay I didn’t quite trust his interest….if you know what I mean XD. All in all from what I do remember, it was loads of fun. BSF: You’re one of the more prominent Carribean cosplayers being featured on the cosplay landscape, in a diverse arena that’s always growing. Do you feel there’s a certain level of significance when it comes to being in this position? BSF: Do you feel that the field of cosplay is an inclusive one, where everyone’s invited to the party, so to speak? Were there ever any hurdles that you might have encountered on this front? PC: Yes and no. If I am speaking from my own personal perspective I would say it honestly depends on which community we are referring to. In the Caribbean it is inclusive, there is no choice. Everyone is practically a POC back home and the cosplay community is incredibly small. There was never any sense of segregation or exclusion as the environment for that way of thinking never truly existed. I was only introduced to that side of cosplay when I made a page and started interacting with and seeing what other cosplayers go through internationally. BSF: Two of my personal favorites of yours in terms of cosplay include the Dhalsim and Cammy outfits (you can tell I’m a Street Fighter fan). Can you speak a little about these pieces specifically, why you chose to do the costuming for each, reaction to both, and how the overall experience was cosplaying as both characters. PC: Hahaha Street Fighter is life! Ummm, both cosplays were done on a whim really hahaha! I had the bald cap from my Riddick cosplay and I wanted to try my hand at applying it again. I saw Miss Sinister’s genderbent Sagat and immediately said, I WANNA TRY DHALSIM! I put the cosplay together in less than an hour for a Street Fighter group photoshoot with some of my friends and two years later somehow the official Street Fighter page got their hands on it and shared it. I didn’t see any of this coming and am still really floored by that! BSF: Do you have a favorite cosplay piece? PC: Yep Demona, hands down! BSF: What can our fans look forward to from you in the future? Any upcoming conventions, competitions? PC: Ooooh sooo sooo much! I will be judging two cosplay competitions next year, one is in January at the Arcadia Cosplayers Ball and the other is the Caribbean Cosplay Championships in July at ALIAS Entertainment Expo. Both events are in Trinidad! Depending on how things go I am hoping to be able to attend a US convention later in the year, but that’s not set in stone yet. Cosplay wise I am currently working on Headhunter Nidalee from LoL (League of Legends) and Ruby Rhod from The 5th Element. I have an album full of cosplays I want to complete in 2016 but with my schedule I have no idea if I will be able to complete them all or not. So here’s to trying!